Happy September, and welcome to mussel season! That means beer season, with a side of wine season. It means butter and garlic season. It means delighting in some of the most affordable, sustainable, and satisfying bounty you can pull from the ocean…season. 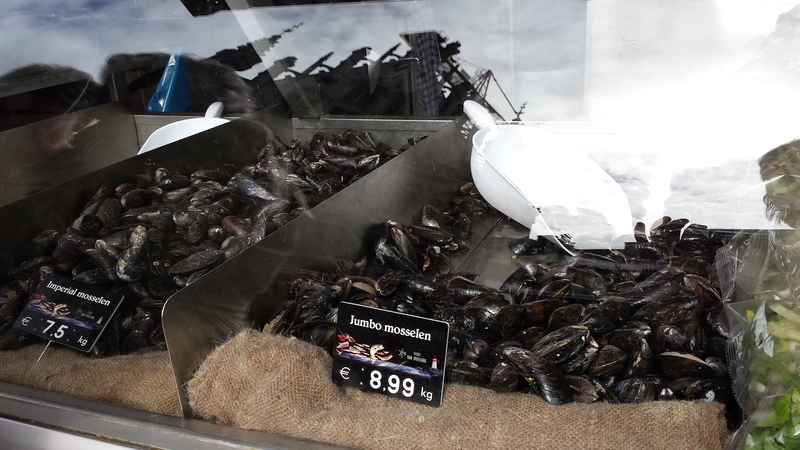 If you haven’t heard, mussels are a pretty big deal here in Belgium. Now that it’s September, they’re everywhere. Sandwich boards line the squares and posters perch on windows, pushing steamed mussel specialties with big price tags. Tourists drop in for their fix, but the locals know better: fresh mussels are dirt cheap, and really easy to cook at home. Seriously, you can make a remarkable mussel dinner with a bit of butter, a splash of wine and a pot. I walked down to the market to get a few, with a bit of an experiment in mind. Although there’s absolutely nothing wrong with a big pot of simply steamed mussels, I thought I’d get creative tonight and combine them with another of my favourite late-summer dishes: succotash. It’s done differently in different places, but succotash generally consists of beans, tomatoes and corn, simmered together with butter and seasonings. It’s the height of summer stews. I hear lima beans are the traditional choice, but I use cannelini. Along with some fresh sweet corn, shallots, garlic, tomatoes and cream, they break down beautifully to make a rich, sweet, thick soup. Fresh torn basil and a bit of tarragon are good herb choices; their slight anise aroma complements mussels really well. 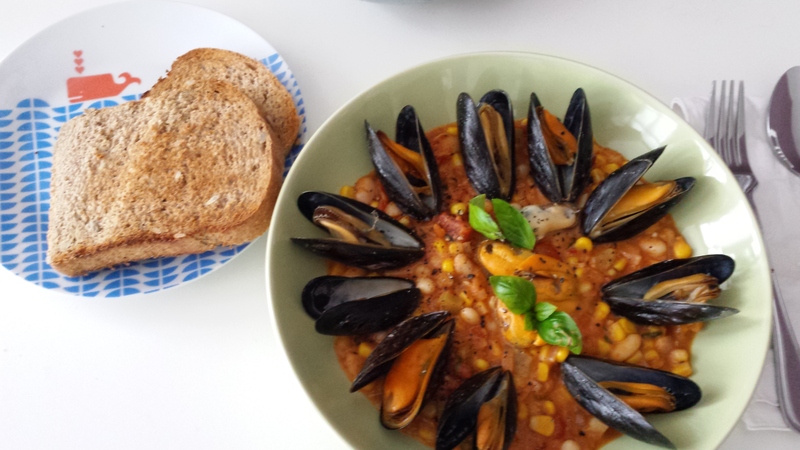 Although I cook the mussels and the succotash separately, the delicious mussel broth gets strained and added to the stew before serving, thinning it out and building the flavour. Have you got some stale bread hanging about? Slice it up — the stew is full of hearty ingredients, but there’s still plenty of room for dipping! In a heavy-bottomed saute pan (or a pot), melt the butter over medium low heat, and when the foaming subsides, add the chopped shallots. Cook, stirring, until translucent, and then stir in the garlic and cook for another minute or so. Toss in the diced tomatoes, celery and beans (and if you’re using dried tarragon, you can add it now). Bring the mixture to a simmer and let it bubble slowly for about 20 minutes, stirring occasionally. *This is a good time to begin prepping and cooking the mussels. You will add the remaining succotash ingredients just before serving. 1. The extent of your preparation will depend on how clean the mussels are when you buy them. If they’re fresh from the fishmonger, you’ll likely have to give them a little more attention: scrub the shells with a hard bristle brush, removing any beards (the fuzzy little tendrils that peek out the shell), and tossing any mussels with broken shells as you go. Mussels can sometimes be a bit gritty, because of the sand trapped in the shell. You can make them open a bit to release the sand by dunking them in cold water for a few minutes — but no longer than that! These are saltwater creatures, so fresh water will kill them, eventually. 2. Get a big, heavy pot — the mussels shouldn’t come up more than halfway when you throw them in. Over medium heat, melt the butter until it begins to bubble, then add the onions. Once they begin to soften, turn the heat up to high, toss in the bay leaf, and add the wine and broth. Bring to a boil and add your mussels, then cover the pot with a tight fitting lid. Let them steam away, shaking the pot every 30 seconds or so to help them cook evenly. After about three minutes, remove the lid and transfer any open mussels to a bowl. Put the lid back on, and check again in another minute. Keep checking and transferring open mussels to the bowl, and toss any that don’t open. Strain the liquid into another bowl, and add as much or as little as you like to the succotash. You’ll also add the corn, fresh herbs and cream to the dish now, and bring everything to a simmer for a few minutes. When the consistency is to your liking, add salt and pepper to taste, and dish out into bowls. As for the mussels, either shell them and throw them in with the succotash, or else leave them in their shells and add a handful to each bowl, leaving the rest in the middle to share.